Harry Dresden, White Council Wizard and Warden (and the only practicing Wizard listed in the Chicago phone book!) repays the second of three favors owed to the Winter Queen, by rescuing crime lord Johnny Marcone from the forces that have kidnapped Marcone from his own panic room. The reasons and the method for the abduction, as well as the Winter Queen’s interest, are the substance of the story; but needless to say, Fae politics and grasps for power are at the heart of it all. From the start, with Storm Front, James Marsters has been Harry Dresden. Interestingly, Small Favor was recorded at about the same time as Blood Rites (#6) in 2008 but the performances in Small Favor far outstrip those in Blood Rites. Marsters is more in command of the story, able to imbue the right tone to “Fuego” (fire spell) as the scenes’ moods dictated; and infuse the characters with humor and pathos. There were times that Marsters didn’t seem to have much to work with, but the drag was temporary and short. 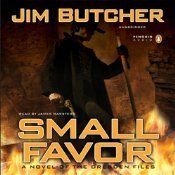 OTHER: I dnloaded a digital audio edition of Small Favor (by Jim Butcher; narrated by James Marsters) from the now defunct digital dnload site, weread4you.com. They used to have amazing sales and I purchased a number of The Dresden Files audiobooks to fill in the gaps in my collection. To be honest, if I hadn’t bought them, I probably would have dropped the series by now; but I did and so I didn’t! I receive no monies, goods or services in exchange for reviewing the product and/or mentioning any of the persons or companies that are or may be implied in this post.